An annual club-kid cruise departing San Diego for 120 hours of techno music en route to Cabo San Lucas, with performances by Dannic, Klingande, and Robin Schulz aboard the nearly 2,000-passenger Norwegian Sun. Bottle service extra. 5-day cruise from $999 a person, roundtrip from San Diego. Only in Portlandia: A one-and-a-half-hour pedal-boat ride on Portland’s Willamette River that’s B.Y.O.B. (though BrewGroup happily provides red plastic cups). May we suggest a Deschutes Big Rig? 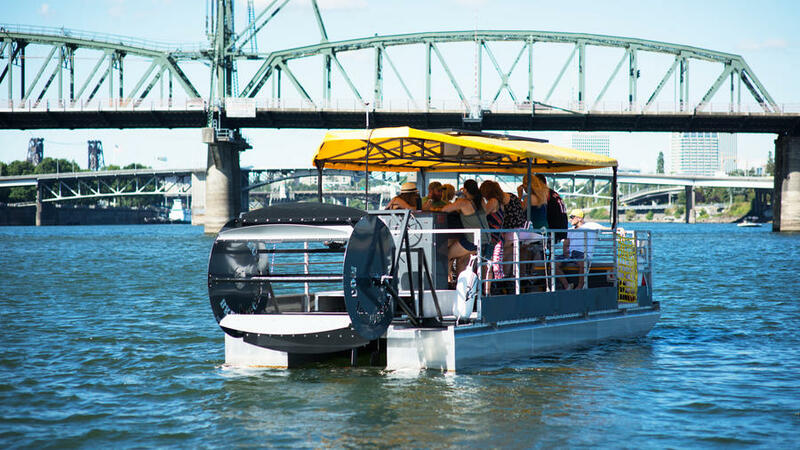 1.5-hour pedal-powered river cruise, from $35. If a two-day getaway is all you need to let loose, this trip to Ensenada and back is your cruise, with bottomless trips to the BlueIguana Tequila Bar and Redfrog Rum Bar included in your activities list. Top down, bottom’s up. 2-day cruise from $109, roundtrip from Long Beach/Los Angeles. You’ll hit Cabo San Lucas, Mazatlan, and Puerto Vallarta on this cheeky tour of Mexico—with plenty of excursions to private beaches and tequila distilleries on the docket. But your days at sea aboard the Ruby Princess are worth the fare alone, thanks to the on-board whiskey bar curated by Ernesto Uchimura. 7-day cruise from $499 per person, roundtrip from L.A. The ultimate in day drinking might just be this two-hour brunch-time yacht cruise on the San Francisco Bay. Bottomless mimosas? Check. A fish-eye-view of the Golden Gate Bridge? Check. Wear your boat shoes. From $75 per person. Some might call a cruise from L.A. to Vancouver a snooze cruise, but when you’re on Princess—with its Gatsby-inspired casino, top-deck nightclub, cigar lounge, and whiskey bar—finding time to sleep might be difficult. 6-day cruise from $499 per person, from L.A. to Vancouver B.C. The original party cruise might well be Cunard, which has been plotting exquisite evenings on its ships since it was founded in 1840. European sailings like this one make hitting Europe’s revelry highlights easy: You’ll sample beers at the new Heineken brewery in Amsterdam and taste a few of some 450 kinds of beer made in Bruges. 4 nights from $669 per person, roundtrip from Southampton, England.